Congenital anomalies of the kidneys and urinary tract (CAKUT) comprise a large spectrum of congenital malformations ranging from severe manifestations, such as renal agenesis, to potentially milder conditions, such as vesicoureteral reflux. CAKUT causes approximately 40% of ESRD that manifests within the first three decades of life. Several lines of evidence indicate that CAKUT is often caused by recessive or dominant mutations in single (monogenic) genes. To date, approximately 40 monogenic genes are known to cause CAKUT if mutated, explaining 5%–20% of patients. However, hundreds of different monogenic CAKUT genes probably exist. The discovery of novel CAKUT-causing genes remains challenging because of this pronounced heterogeneity, variable expressivity, and incomplete penetrance. We here give an overview of known genetic causes for human CAKUT and shed light on distinct renal morphogenetic pathways that were identified as relevant for CAKUT in mice and humans. Development of the kidneys and urinary tract. (A) The bilateral nephric ducts (NDs; alternatively mesonephric ducts or Wolffian ducts) and the nephric cords (NCs) are the precursor structures of the adult urinary system. Both originate from the embryonic intermediate mesoderm. The cells of the ND undergo an early mesenchymal to epithelial transition and assemble into epithelial tube–like structures. The associated NC retains characteristics of mesenchymal tissue.16,62 (B) As the embryo develops, the ND elongates caudally. At approximately E9.5, the most caudal portion of the ND fuses with the cloacal epithelium (Cl). The cloaca is the embryonic precursor of the bladder, and it is derived from cloacal endoderm.16,66 (C) The NC reorganizes and forms a morphologically distinct domain: the MM. Renal morphogenesis is initiated and maintained by reciprocal interactions between the epithelial ND and the MM. In mice, at embryonic day approximately E10–E10.5, signals from the MM induce the formation of a circumscribed, broad swelling of the ND at the level of the MM.15,16 (D) At E10.5 in mice and around the fifth week of human gestation, the UB emerges from the swollen portion of the ND and grows dorsally toward the MM.4,15,16,74 The caudal part of the ND, which is located between the UB and the insertion into the Cl, is referred to as the common nephric duct (CND). (E) Stimulated by MM-derived signals, the UB begins to branch repeatedly (branching morphogenesis) at approximately E11.5. Through continuous reciprocal induction, the MM is important for promoting and maintaining branching events of the UB. The UB branching continues for approximately 9–13 cycles (mice) and then slows down after approximately E15.5. 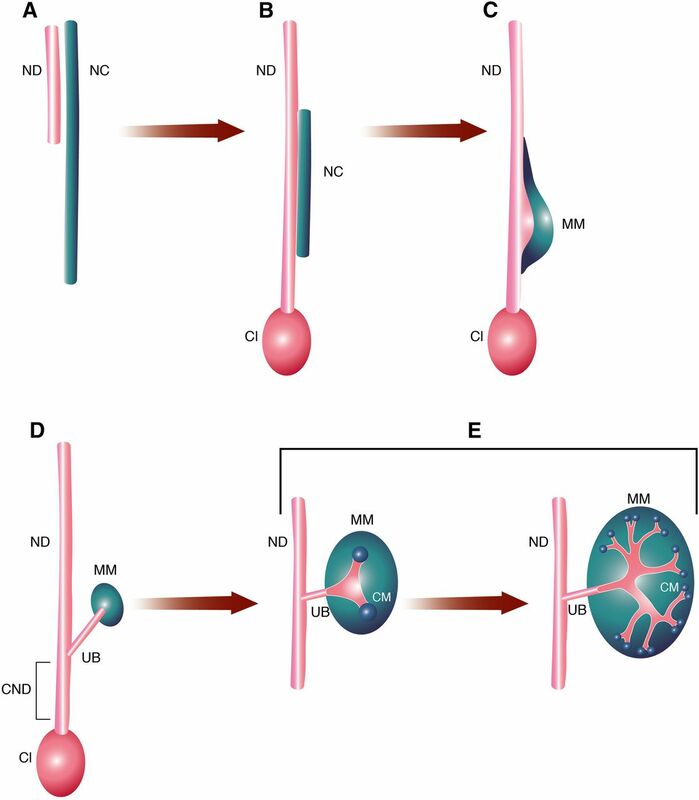 Via branching morphogenesis, the UB gives rise to the renal collecting system consisting of collecting ducts and renal pelvis as well as the ureter. Reciprocally, signals from the UB also support development of MM cells. The MM that is in closest proximity to the UB tips condenses and forms the so-called cap mesenchyme (CM). 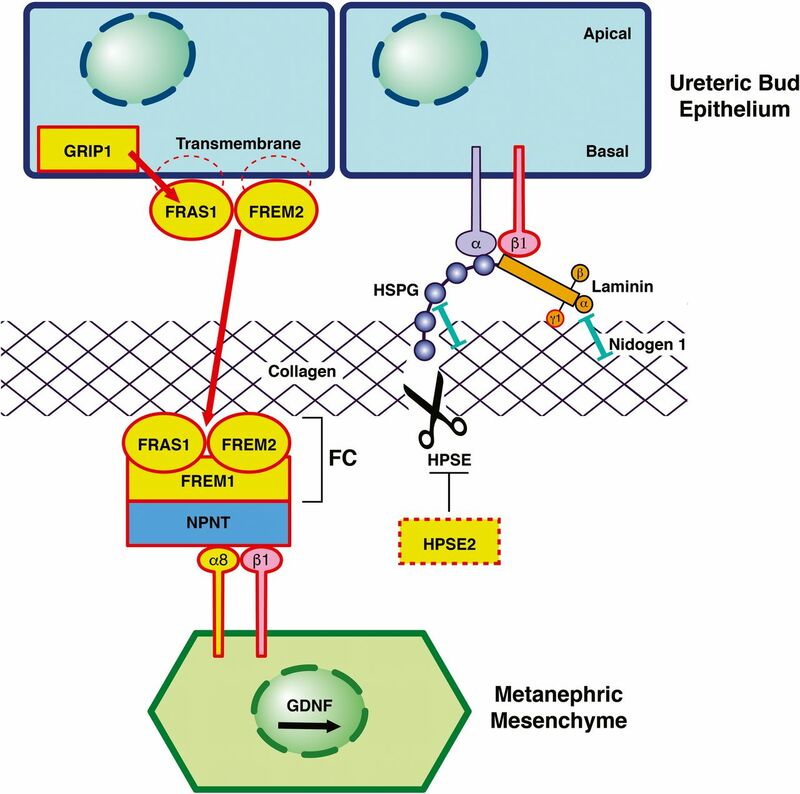 Stimulated by signals from the UB, the CM undergoes a mesenchymal to epithelial transition. The epithelial cell population subsequently gives rise to structures of the nephron (glomerulus, the proximal tubule, and the distal tubule). Modified from refs. 16 and 62, with permission. Nowadays, modern study designs increasingly yield potential polygenic disease loci for a wide variety of human disease conditions.61 Despite the complicated etiology of CAKUT, which suggests an interplay of (epi-)genetic and environmental factors,3,62 to date, there is little evidence for the simultaneous contribution of more than one gene (di-, oligo-, or polygenic effects; i.e., complex genetics) to the pathogenesis of human CAKUT.63 Similar to monogenic research, the identification of polygenic causes of CAKUT is likely complicated by the vast heterogeneity of CAKUT. This results in very few affected patients with shared disease loci essential for the unequivocal identification of novel genetic regions. General awareness of the possibility of complex inheritance patterns in CAKUT is necessary in the genetic evaluation of affected individuals. Polygenic disease hypotheses, however, remain challenging to establish, test, and prove in human CAKUT. The insights from mouse models, however, do not always directly translate to human genetics. Explanations for this discrepancy include potential species-specific differences in the development of the kidneys and urinary tract, alterations in the required gene dosage during developmental steps, functional compensation by redundant genes, incomplete penetrance, and likely, merely the rarity of human cases with mutations in a particular gene (due to distinct heterogeneity). ECM proteins cause murine and human CAKUT. Schematic of the interface between the UB and the MM in renal development. Proteins encoded by genes that, if mutated, cause monogenic CAKUT in humans are highlighted in yellow. Red frames indicate proteins encoded by genes mutated in CAKUT in mice. (Left panel) FRAS1 and FREM2 localize in epithelial cells of the UB as transmembrane proteins with intracytoplasmic tail regions.41,98,103 The interaction with PDZ domains of the intracellular protein GRIP1 is essential for targeting to the basal surface of the UB cells and shedding of FRAS1 from the membrane.98,107 FREM1 is produced by the MM and secreted into the extracellular space.106,107 FRAS1, FREM2, and FREM1 assemble at the epithelial-mesenchymal interface to form the FC.107 Mutations in the genes encoding these proteins cause CAKUT (Supplemental Figure 2). Also, mutations in GRIP1 result in human and murine CAKUT. Nephronectin (NPNT) functions as an adaptor to interconnect the ternary FC with the ITGA8/integrin-β1 heterodimer on the surface of MM cells. ITGA8/integrin-β1 signaling leads to an increased expression of GDNF by the MM, thereby promoting renal morphogenesis.183 Mutations in ITGA8 in humans and mice cause CAKUT.44 Loss of FC integrity results in a significant decrease in GDNF expression in the MM, thereby hampering the interaction between the UB and the MM and consequentially, impeding renal morphogenesis.183 (Right panel) Laminins are cross-shaped ECM molecules that consist of three distinct chains (α, β, and γ).101 Laminins simultaneously interact with cell surface receptors (integrins), HSPG, collagen, and nidogen 1 (see box).184 Laminins that contain γ1-chains form high-affinity interactions with nidogen 1.101 Fourteen distinct laminin isoforms have been identified to date, of which ten possess the laminin-γ1 chain.101,185 A homozygous ablation of the nidogen binding site in laminin-γ1 has been shown to result in severe CAKUT phenotypes (including bilateral renal agenesis) in mice.101 Despite its important role in ECM assembly, targeted inactivation of nidogen 1 did not result in a CAKUT phenotype.101 Both nidogen 1 and Laminin are known interactors of HSPG. HPSE is one of the few enzymes with the ability to break down HSPG.115 Knockdown of neither HSPG nor HPSE has been reported to cause CAKUT phenotypes in mice.115,120,186,187 However, recessive mutations in HPSE2 have been identified in human patients with urofacial syndrome,43,93 with a similar phenotype in mice.43 Although HPSE2 has no detectable enzymatic activity itself, it has been shown to function as an endogenous inhibitor of HPSE (Supplemental Figure 3).116 Modified from refs. 107 and 184, with permission. Members of the BMP signaling cascade with a role in CAKUT. Proteins encoded by genes that, if mutated, cause murine CAKUT are outlined in red, and proteins highlighted in yellow constitute causes of isolated and/or syndromic manifestations of human CAKUT (Supplemental Table 4). BMPs act as ligands for two classes of transmembrane serine-threonine-kinase receptors on the surface of the corresponding effector cells (e.g., bone morphogenic protein receptor type 1A [BMPR1A] and BMPR2).155 After activated, these receptors initiate intracellular signaling cascades, including canonical SMAD signaling and noncanonical signaling (e.g., via mitogen-activated protein kinase [MAPK]), which eventually result in increased expression of distinct target genes in the cell nucleus.175,176 The cellular consequences of BMP signaling depend on the location and local concentration of the BMP ligand.177 The availability of ligands for receptor binding is regulated by diverse intra- and extracellular antagonists and agonists of BMP and includes, for example, Gremlin 1 (GREM1), Follistatin (FST), and bone morphogenic protein binding to the endothelial regulator (BMPER).178–180 Please note that, BMPR2, although depicted in the figure, has not been implicated in the pathogenesis of CAKUT to date. CRIM1, cysteine-rich transmembrane bone morphogenic protein regulator 1; CTDNEP1, CTD nuclear envelope phosphatase 1; GPC3, Glypican 3. Conversely, we recently found that missense mutations in FRAS1, FREM1, FREM2, or GRIP1 result in isolated CAKUT phenotypes (Figure 2).42 These findings thereby indicate, that, in the case of the FC genes, the disease manifestation can vary from severe syndromic phenotypes on the basis of truncating mutations to isolated CAKUT on the basis of hypomorphic mutants (e.g., missense) (Supplemental Figure 2). Overall, the multitude of murine and human disease phenotypes that occur as result of disturbances in HSPG biosynthesis provides important insight into the mechanisms involved (Supplemental Figure 3, Supplemental Table 3).117,118 However, although for some HS-relevant enzymes, there are strong loss-of-function phenotypes in animal models, mouse models for other HS-related ECM components (e.g., mouse models with a knockout of HPSE function) do not result in overt defects, thereby suggesting a redundancy of certain HS enzymes and HSPGs in the ECM that allow for a functional compensation.96,119,120 This hypothesis, however, remains to be validated by additional functional studies in the future. 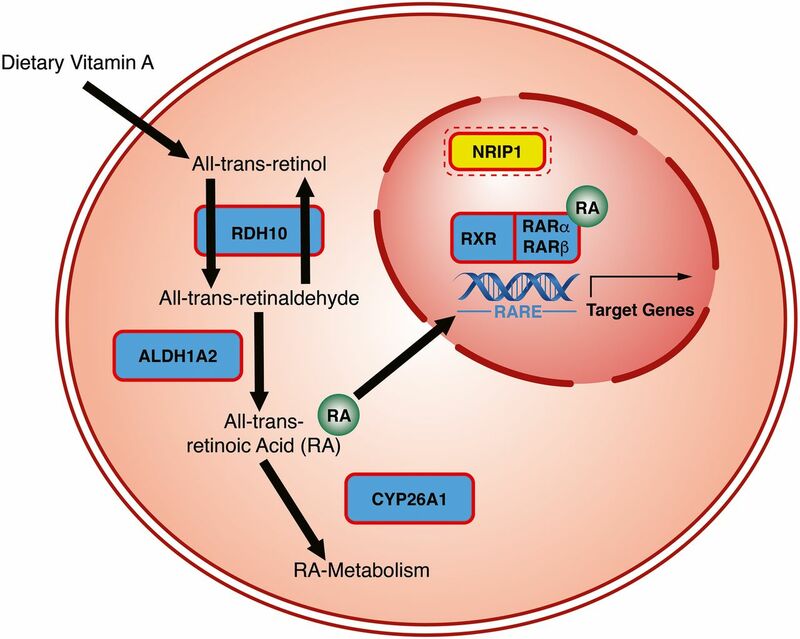 RA plays an important role in the transcriptional regulation of developmentally relevant target genes.66,121 Retinoid X Receptor-α (RXR) and Retinoic Acid Receptor (RAR; are nuclear receptors that bind RA each has three subtypes, α, β, and γ, with different isoforms).121,141–143 RXR (5′) and RAR (3′) assemble to heterodimers and bind to RA-responsive elements in the DNA (Figure 3),121,123,141,142,144,145 thereby controlling transcription of functionally diverse target genes.121,141 The specific subtype and combination of RXRs-RARs thereby most likely permit a certain tissue selectivity, while at the same time, sustaining the pleiotropy of RA-mediated effects.123 RXR and RAR can additionally bind coregulators (coactivators and corepressors), which adds another level of complexity to the transcriptional regulation of RA-dependent genes in an RA-dependent manner.121,131,141,142,146–149 A potential contribution to the tissue specificity of RA-mediated effects via tissue-specific expression patterns of coregulators is likely. Mutations in genes encoding enzymes that are involved in intracellular processing of RA, such as Retinol Dehydrogenase 10,150 Aldehyde Dehydrogenase 1 Family Member A2,138 and Cytochrome P450 Family 26 Subfamily A Member 1,151,152 as well as double mutants of specific isoforms within the RXR (Rxrα) and RAR family of proteins (Rarα and Rarβ)123 (Figure 3) have previously been shown to result in multisystemic phenotypes in mice that resemble VAD syndrome and present manifestations from within the CAKUT spectrum. To the knowledge of the authors, this is the first time that a protein involved in RA signaling did not result in a syndromic CAKUT phenotype but rather, resulted in a selective CAKUT phenotype. This could potentially point toward a role for this coregulator in a select group of tissues as opposed to Retinol Dehydrogenase 10, Aldehyde Dehydrogenase 1 Family Member A2, and Cytochrome P450 Family 26 Subfamily A Member 1, RARs, and RXRs, which exhibit very broad expression patterns. Although this would have to be further elucidated, the possibility exists that, in the future, more regulators of RA-dependent transcriptional regulation may be identified in patients with cases with isolated features from within the syndromic VAD phenotype. Bone morphogenic proteins (BMPs) constitute the largest family within the TGFβ superfamily of molecules.155 BMPs were originally identified as bone-derived proteins capable of inducing ectopic bone formation in vivo.156,157 Nowadays, the BMP pathway is renowned for its importance in general embryogenesis, with diverse roles depending on the spatial and temporal context.78 A large number of in vitro and in vivo studies underscore a crucial role of BMP signaling for renal morphogenesis in animal models (Figure 4, Supplemental Table 4).79–92,158–160 Also, the development of the human kidney and urinary tract seems to depend on intact BMP signaling. This is indicated by the finding of mutations in genes inter-related with BMP signaling in patients with isolated (BMP421 and GREM142) or syndromic (BMPER,94 BMP4,95 and GPC3161) manifestations of human CAKUT. Mechanisms of BMP signaling in the context of renal development are briefly outlined in Figure 4. Figure 4 depicts components of the signaling cascade that have previously been reported to result in manifestations of murine CAKUT if mutated (outlined in red in Figure 4).79–92,158–160 Some of these genes/proteins have additionally been identified in human forms of isolated (BMP421 and GREM142) or syndromic (BMPER,94 GPC3,161 and BMP495) CAKUT (highlighted in yellow in Figure 4). In general, BMP ligands induce cellular responses by forming complexes with two major types of diverse membrane-bound serine-threonine kinase receptors: type 1 BMP receptors and type 2 BMP receptors.155 Both types 1 and 2 receptors are required for subsequent transduction of the BMP signal.173,174 The cellular responses, however, seem to be defined by the type 1 receptor.155 Downstream of ligand-receptor binding, BMPs activate either a canonical or a noncanonical signaling cascade through phosphorylation of downstream effectors. The canonical BMP pathway transmits signals via Smad proteins.175,176 Noncanonical BMP signaling includes the activation of the mitogen-activated protein kinase family of signaling molecules.175 Both signaling cascades eventually result in the increased transcription of corresponding target genes in the nucleus. 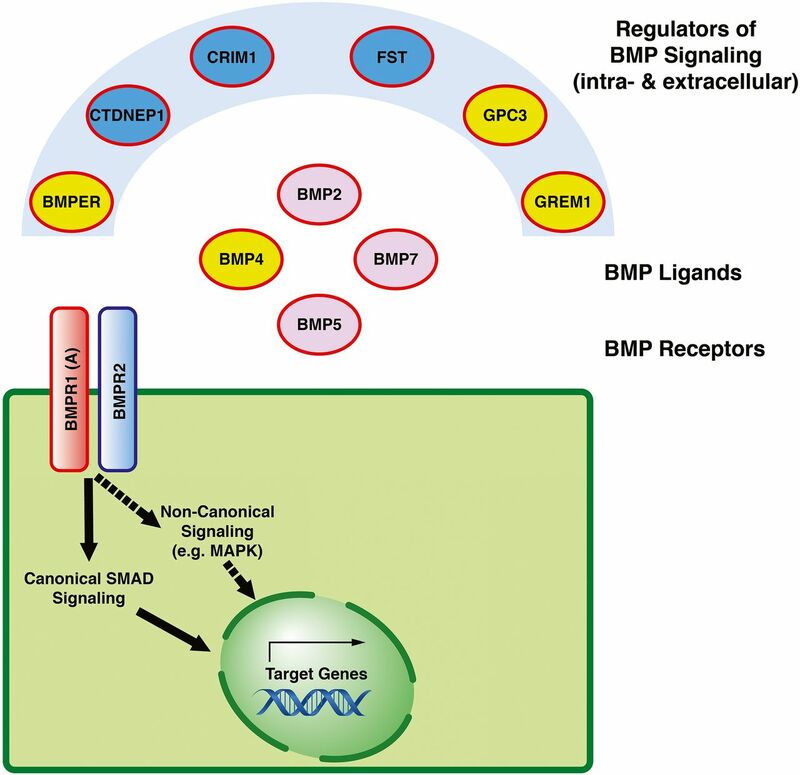 The location and local concentration of the BMP ligand hereby determine the exact cellular consequences of BMP signaling.177 Intra- and extracellular agonists (e.g., BMPER) and antagonists (e.g., GREM1 and FST) of BMP tightly regulate the level of ligand-receptor interaction at the ligand or (more rarely) the receptor level,178–180 and they play an important role in renal development. In conclusion, a long-standing hypothesis has recently found strong confirmation; it stated that CAKUT, to a large part, is caused by single-gene mutations in a high number of different monogenic CAKUT genes, involving different genes in different patients. Whole-exome sequencing (WES) has facilitated discovery of these genes. Even the subhypotheses found confirmation, stating that monogenic CAKUT genes would often represent candidate genes from mouse models of CAKUT, renal developmental genes, or genes known to cause human clinical syndromes that have a CAKUT component. The fraction of approximately 17% of patients with CAKUT, in whom a monogenic cause can be detected by WES, is lower than that in other causes of early-onset CKD, being approximately 30% in steroid-resistant nephrotic syndrome181 and 70% in renal cystic diseases.182 Monogenic CAKUT genes are more difficult to identify due to the high contribution of autosomal dominant renal developmental genes, which often exhibit features of incomplete penetrance (lack of genotype-phenotype correlation) and variable expressivity (differing organ involvement). Previous experience, however, strongly suggests that, before complex genetic mechanisms have to be evoked, such as polygenic inheritance or epigenetic mechanisms, hundreds of monogenic causative genes for CAKUT genes will still be identified. In this context, the ability to represent a patient’s exact mutation in an animal model of CAKUT (e.g., mice or Xenopus) using CRISPR/Cas knockin techniques has strong potential to conclusively define genotype-phenotype relations for patients with CAKUT. Identification of monogenic causes of CAKUT by WES will rapidly become common practice in pediatric nephrology and urology clinics due to reduction in cost for WES and continuous improvement of algorithms that define deleteriousness of mutant alleles. Discovery of additional monogenic CAKUT genes will strongly aide our understanding of the complex pathogenesis of CAKUT. In addition, molecular genetic diagnostics using WES may offer important advances to clinical management for patients with CAKUT, who represent about 50% of all patients with ESRD before age 25 years old, because causative mutations will soon allow for prognostic conclusions, such as outcomes of reconstructive surgery, rate of progression into renal failure, and the likelihood for the development of extrarenal complications. A.T.v.d.V. is supported by postdoctoral research fellowship VE916/1-1 from the German Research Foundation (DFG). A.V. is supported by a Fulbright postdoctoral scholar award and grants from the Manton Center Fellowship Program, Boston Children’s Hospital, and the Mallinckrodt Research Fellowship. F.H. is the William E. Harmon Professor of Pediatrics. This work was supported by National Institutes of Health grant DK088767 (to F.H.). F.H. is supported by the Begg Family Foundation for Research into Reflux Nephropathy. This article contains supplemental material online at http://jasn.asnjournals.org/lookup/suppl/doi:10.1681/ASN.2017050561/-/DCSupplemental.